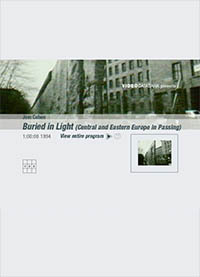 BURIED IN LIGHT (1994; Super 8 transferred to video, 60 minutes) An impressionistic survey of Eastern and Central Europe in transition, Buried in Light was made as both a film and an installation, the latter commissioned by the High Museum of Art in Atlanta. The installation featured three monitors with synchronized images that echoed and played off each other; viewers could watch from old church pews, surrounded by vitrines of ephemera--maps, film stills, Karl Blossfeldt-like photographic plant studies. Subtitled "Notes and a Wanderer's Phrasebook," the movie version is punctuated with title cards displaying foreign phrases ("Der Ausverkauf: seliout/clearance sale," "odjezd: departure") that often carry elegaic double meanings. JC: I hadn't left the US for fifteen years. The Berlin Wall came down, and for a couple years I had this burning sense: "You should just get over there, because whatever the hell is going on is going to happen really fast." Of course, corporate capitalism and globalization was what was going to happen. But the point was, I didn't know those places. I didn't even really have pictures in my head. I intentionally went over there blind. I had Super-8 cameras, and I just wandered around and got on trains and walked and walked and walked. I didn't even know what the big tourist places were that I should be avoiding. So the pictures came first, the research later. To edit it, I sort of bluffed that I was really familiar with the Avid, and a big Atlanta editing joint let me work nights for months. I'd get up in the afternoon, read about Eastern Europe, and once the commercial people left, I'd cut all night.